A call to Marcel Borgmann at Sea Independent brings news of a €250,000 price cut on the 34.5m motorsailor Cobra King. 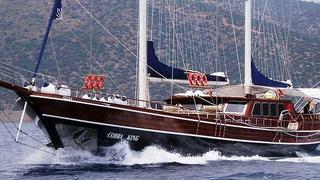 Built by Cobra Yachts in 2005 with an oak frame, teak decks and mahogany planks, Cobra King is a fine example of a traditional low-profile wooden gulet. She offers superior comfort and amenities while cruising. The five cabins are each equipped with en suite baths and individual climate control. Thick mahogany bulkheads provide additional sound insulation, ensuring a relaxed and pleasant cruise for all on board. A spacious saloon and lounge feature elegant seating and an updated entertainment center. Lying in Turkey, Cobra King is now asking €2.25 million.